This post was originally published December 29, 2014. For Christmas, I treated myself to the Kindle version of The Life-Changing Magic of Tidying Up: The Japanese Art of Decluttering and Organizing by Marie Kondo. This book has been getting a lot of buzz on the minimalist blogs, and it sounded like it might have some interesting ideas. The author is Japanese and works with clients in Japan, where homes are smaller, so I thought she might have some great “small-space” tips. I have not finished reading it yet, but there does seem to be lots of good advice and perspective so far, and I have thoroughly enjoyed it. I was happily reading along Saturday afternoon when I reached a part of the book in which the author advises the best way to store socks. 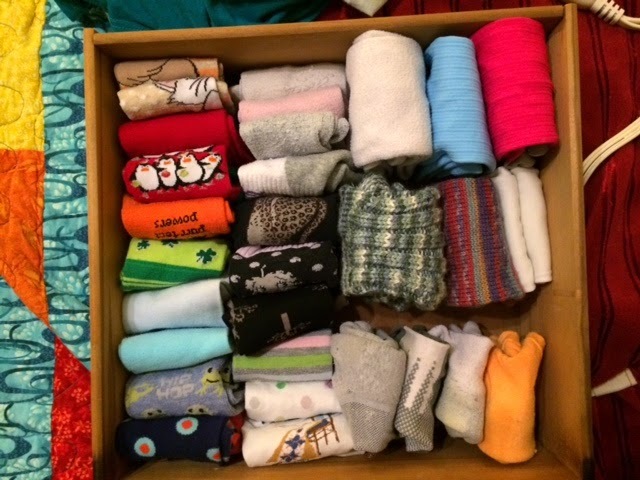 She described her horror at learning that one of her clients kept all her socks in rolled “potatoes”, the cuff of one sock turned over the other to keep them together, then stuffed unceremoniously into the sock drawer. The author explained that this method of storage stretches the sock cuffs, and stresses the fabric of the socks. Also, with your socks in potatoes, it is difficult to find what you are looking for within your sock drawer. The socks on top tend to get worn over and over merely because they are conveniently placed, while other pairs remain hidden and buried in the back of the drawer. This thought really struck me! This is how I have stored my socks for years! I will put the two socks together, then roll the cuff of one over the other so they stay together it the drawer. However, even though I recently went through and culled out many, many pairs of socks, I can still barely open and close my sock drawer. I enjoy knitting my own socks, so I have several pairs that are thick and bulky, taking up the lion’s share of the room in the drawer. 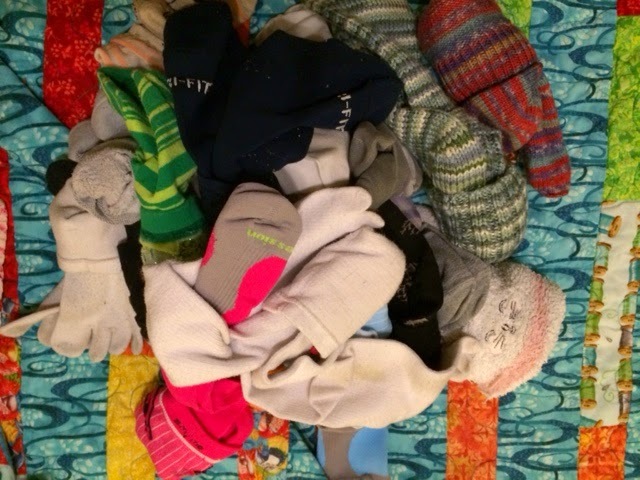 Another drawback with the “potato” method that has always frustrated me is that I can never find my running socks, which are shorter and thinner, so they get lost in the drawer, while my compression socks, which come to the knee, tend to be omnipresent strings throughout the drawer. After reading the section of the book about sock folding, I immediately decided to try it out. I went upstairs and emptied my sock drawer onto the bed. Notice the bright pink compression socks at the bottom, and the bulky knit socks on the right. Next, I took each pair of socks and folded them neatly. I started with the running socks, which are primarily ankle socks. I placed each pair together and folded them at the heel. Next, I folded my knit socks and trouser socks. For these, I folded the toe up to meet the heel, then folded to upper part over that (so, two folds). For my compression socks, I folded them in half, then in half again. Then, I placed all my nicely folded socks in my sock drawer, each folded pair standing vertically. Look how pretty! All my running socks are right in front where I can get them quickly when I am trying to dash out for a run. Compression socks are in the back, since I use them less frequently. Knit socks on the right, and socks for work on the left. I can SEE all my socks at once, and can tell if I need to do a wash to have clean work socks or running socks. The whole thing only took about five minutes. You have no idea how happy my new sock drawer has made me! Several times when I was in the bedroom, I just opened it and admired my happy socks. On Sunday night, I had several freshly laundered pairs of socks to put away, so I folded them nicely and “filed” them in the drawer. Even though the drawer looks full, there was still plenty of room as the socks are not jammed together. The drawer opens and closes easily as well, with no socks getting caught. When I got ready for work this morning, it was very easy to find my gray socks that I wanted to wear! My success with my socks has renewed my simplifying and organizing enthusiasm. (I offered to organize my husband’s and daughter’s sock drawer, but they both declined.) It made me realized that our house does indeed have plenty of space, if we only utilize it properly.